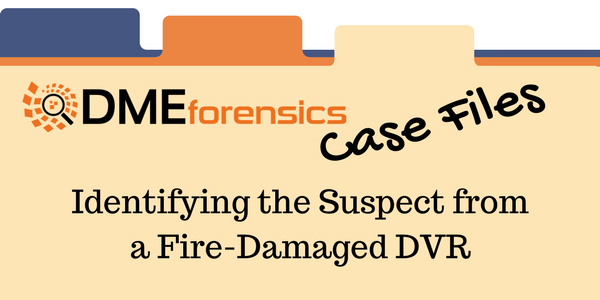 Case Files: Fire Damaged DVR - DME Forensics Inc. This guest post comes from James Cadden of East Lansdowne Police. In early February of 2018, a suspected arson fire destroyed a 40-year-old family business in our small community. The family, employees, and neighbors were devastated. A DVR security camera system was operating in the business at the time of the fire and quickly became the only reliable form of evidence. While attempting to retrieve the DVR system using traditional methods, we learned it too had been damaged by the fire. We worried that all hope was lost. We were able to recover the hard drive inside of the fire damaged DVR and were relieved find it functional. Several of the best known traditional forensic tools were applied to the hard drive with no effect. That’s when we called DME Forensics. DME Forensics was able to connect us with DVR Examiner, which recovered all the security camera footage, including valuable metadata. This metadata helped to provide the kind of granular evidence integrity that is necessary in a criminal prosecution. After recovering and reviewing the video from the fire damaged DVR, we were able to find a critical two-minute video clip that allowed us to determine not only how the fire started but also who was responsible. This case was brought to a successful conclusion, thanks to our friends at DME Forensics, and we could not be happier. In more than 25 years of computer forensic investigations, I have never found an effective solution for examining DVR systems. Mainly because none existed before DVR Examiner. DME Forensics has managed to fill this void with a product that is both powerful & effective. DVR Examiner is constructed with a user interface that is amazingly intuitive and geared for heavy caseloads. DVR Examiner can understand and process an amazing array of obscure filesystems commonly used in DVR products. Finally, DVR Examiner’s audit logs and file listing abilities add the final touch to a product that is long overdue. We are proud of the success DVR Examiner displays time and time again with arson cases. If you have a damaged DVR, hope is not lost. You can try out DVR Examiner for yourself with our free 30-day trial.